SOLD Pegasus and Dionysus Didrachm Pendant; Please Explore Our Greek Pendants For Similar Items. 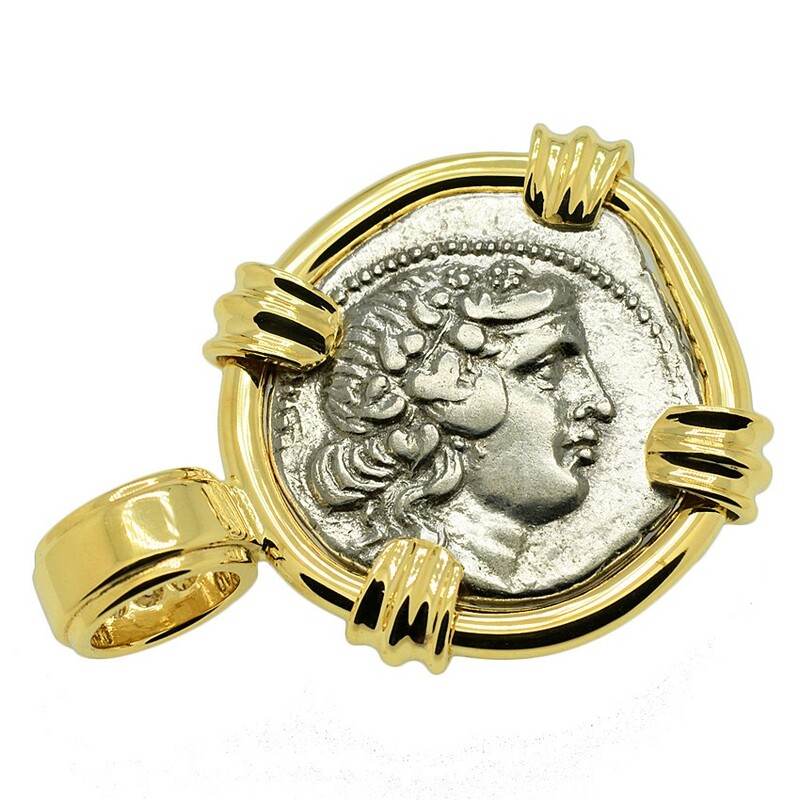 This ancient coin was minted in Korkyra, which was a great Greek city on the island of Corfu in the Ionian sea. Korkyra was a colony of Corinth, founded around 730 BC. However, antagonism grew between Corinth and its colony and by the 5th century BC, Korkyra was one of the three great naval powers in Greece, along with Athens and Corinth. The island of Corfu is bound up with the ancient times of Greece from the beginnings of Greek mythology and its history is full of battles and conquests. In 229 BC, following the naval battle of Paxos, Corfu was finally captured and became a Roman protectorate and naval station. 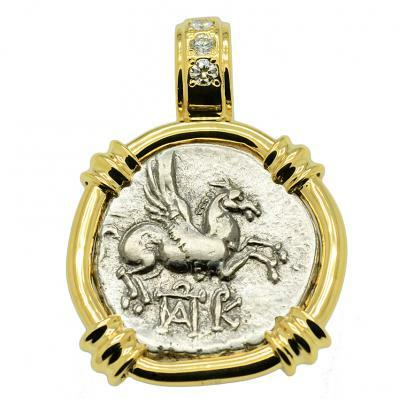 The obverse of this coin depicts Pegasus, the Greek mythological flying horse. Pegasus first set foot on Earth at Corinth. With the help of Athena, who presented him with a golden bridle, a young Corinthian nobleman named Bellerophon captured Pegasus while he paused to drink from a spring. He then tamed Pegasus so he could ride on its’ back and defeat both the Chimera and the Amazons, tasks which would otherwise have been impossible for a mortal. 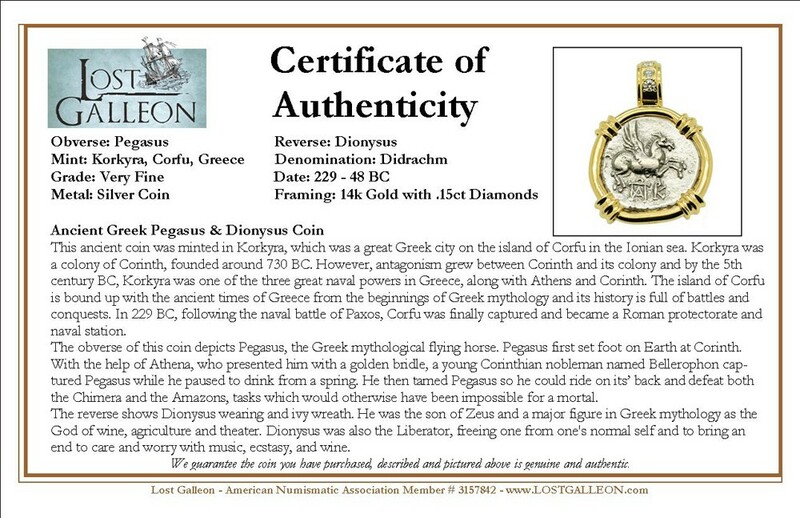 The reverse shows Dionysus wearing and ivy wreath. He was the son of Zeus and a major figure in Greek mythology as the God of wine, agriculture and theater. Dionysus was also the Liberator, freeing one from one's normal self and to bring an end to care and worry with music, ecstasy, and wine.